Save 10% on supplies with your WorkCentre 3655i purchase (available at checkout). Get your prints in a snap with print speeds up to 47 pages/minute and a first-page-time as fast as 8 seconds. A 7-inch color touch screen features bright, intuitive icons. Get easy access to all major functions directly from the home screen, including a wealth of workflow-optimizing capabilities. Scan paper documents to searchable, multi-page PDFs with Optical Character Recognition. Scan files directly into Xerox DocuShare®. Or scan to cloud-based repositories like Google Docs™ and Dropbox™. Keep costs under control. User Permissions allow the ability to restrict access to print features by user, group, time of day, or by application. For example, rules can be set so that all Microsoft® Outlook® emails automatically print in duplex mode. Administrators can choose to require that users enter a passcode to enable printing. Documents not printed within a specified time will be deleted. Operate the control panel on an office PC as if you were standing at the device — troubleshoot, train, or monitor. Print from your Apple iPhone® or iPad® over your office WI-FI with no drivers to install with Apple® AirPrint™. With the Xerox® Print Service Plug-in for Android™, printing is simple. 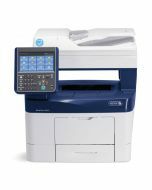 This plug-in lets you easily print to a Xerox® ConnectKey Technology-enabled MFP through a wireless network. Protects you from outside threats and allows only safe, pre-approved files and functions to be executed. Document Handler Duplex Automatic Document Feeder: 60 sheets; Custom sizes: 5.5 x 5.5 in. to 8.5 x 14 in. Media Sizes Up to 8.5 x 14 in. Certifications FCC Part 15, Class A, FCC Part 68, CE Mark applicable to Directives 2006/95/EC, 2004/108/EC and 1999/5/EC, UL 60950-1/CSA 60950-1-07, 2nd Edition, EAC, RoHS Directive 2011/65/EU, WEEE Directive 2012/19/EU, ENERGY STAR® qualified.